Setting up Cisco’s ecosystem partners for new opportunities in artificial intelligence (AI) and machine learning (ML), the vendor on Monday announced the new UCS C480 ML M5 rack server, the latest in its UCS portfolio. The new server complements the existing Cisco portfolio of B-Series, C-Series, and HyperFlex systems with GPUs to address any AI/ML use case from test/dev to training and inferencing. 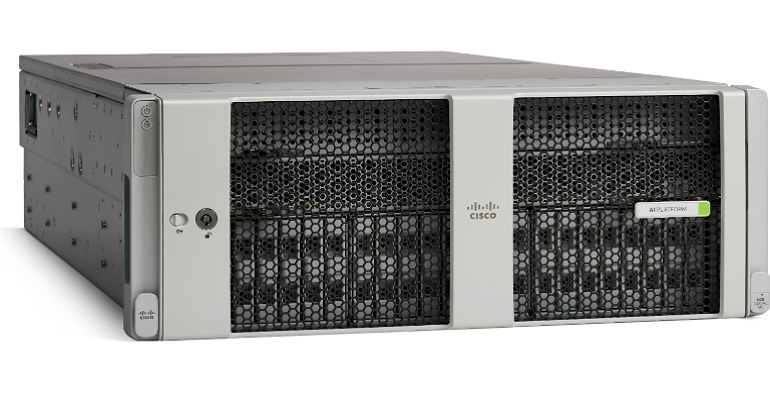 “The UCS C480 ML M5 is an extension of our product line in the UCS server lineup, and is a system built from the ground up to tackle the heaviest machine learning workloads,” Todd Brannon, director, data center marketing at Cisco, told us. The UCS 480 ML M5 is a 4U server with the latest Intel Xeon scalable processors and 8 NVIDIA Tesla V100-32G GPUs with NVLink interconnect providing higher bandwidth and improved scalability for multi-GPU system configurations. The new server also offers flexible options for CPU, network, local storage, memory and OS. Cisco’s AI/ML push targets one of the top priorities for businesses, which is to learn from the growing amounts of data, the fuel for AI and ML, to expand their competitive edge. The company notes that eight out of 10 businesses have already implemented or are planning to adopt AI as a customer service solution by 2020. Furthermore, by 2020, insights-driven business will steal $1.2 trillion per year from their less-informed peers. And, by 2035, AI technologies are projected to increase business productivity by up to 40 percent. In addition to the new server announcement, Cisco also reported that over the past four years, it has been working with machine learning software, or ISV, partners. For example, Cloudera Data Science Workbench is a Cisco Validated Design (CVD), which integrates an existing big data CVD for Cloudera with deep-learning frameworks such as TensorFlow and PyTorch. Cisco is also working with Hortonworks to validate Hadoop 3.1 in a design where the Cisco UCS C480 ML is part of the big data cluster, storing data on the C480 ML disk drives, and supporting Docker containers running analytic workloads such as Apache Spark and Google TensorFlow that require both CPUs and GPUs. Cisco is also contributing code to Kubeflow, a Google open source project, which integrates TensorFlow with Kubernetes. The company is working with Anaconda to ensure that data scientists can collaborate on machine learning using languages such as Python. Cisco’s computing solution for machine learning is designed to help IT by eliminating operational silos with Cisco Intersight for unified cloud-based management, demystifying AI/ML stacks, and powering the full AI data life cycle. According to Scott Mohr, director, data center/cloud go to market, global partner organization at Cisco, there are several opportunities for Cisco partners — alliance, digital system integrators and traditional VARs. For starters, the new UCS C480 ML M5 rack server offers partners the opportunity to expand the UCS footprint with existing customers and new customers. Cisco’s AI/ML strategy also moves partners into the role of providing an advisory role to guide and help customers plan their AI/ML use cases. “With large data lakes that have never been tapped into before, we’re unlocking the power of all of the data that’s been collected to provide partners with the opportunity to offer new strategic services, such as planning and life-cycle management,” Mohr said. Partners who are able to provide coding or scripting for use cases and outcomes, or customization, could gain additional stickiness with customers. Finally, there are AI/ML service opportunities for comprehensive reference design solution stacks for fast adoption or subscription services for global management that lead to recurring revenue, for example. Expect to see Cisco roll out a learning road map that also includes new bundles as well as updates to rebates and VIP programs. Cisco will also offer new training in AI and ML, as well as best practices. There will be more to come about special pricing, spiffs, and promos, according to Mohr. Cisco UCS and data center certified partners are best positioned to take advantage of the new offer. For starters, Cisco is targeting about 50 partners with deep learning capabilities before moving onto its more than 1,400 UCS and data center certified partners, globally. However, there’s a massive shortage of talent with AI/ML skills. Cisco is not only helping partners scale their capabilities with its IT services and customer experience, but the company is also leveraging strong alliances and partnerships to help meet customer requirements. “We’re putting a lot of resources into this area [AI/ML] and ultimately this is an area that our partners are going to play a big role in helping us deliver these AI/ML experiences for our customer,” Mohr said.